Hireology is excited to share that we’re expanding our current office space by 10,000 square feet to support our rapidly growing team. BIG Construction, LLC and Box Studios are leading the office build out and the expansion will feature a new all-hands meeting area, collaboration spaces, a new cafe and a boardroom. 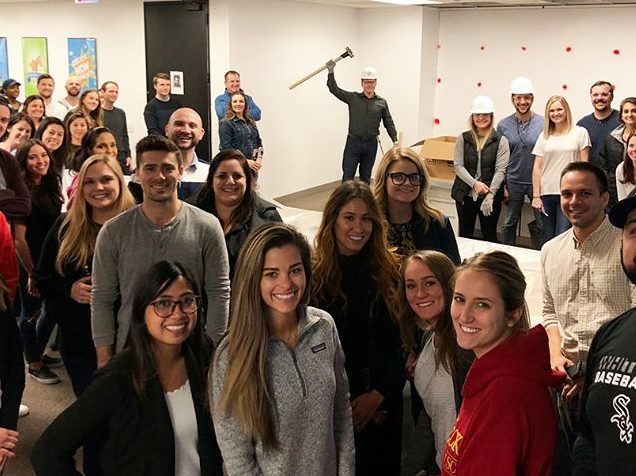 In addition to the new space, we’re renovating our existing 15,000-square-foot office to continue offering a great work environment for our 150+ employees. The Hireology team gathers to knock down the wall for our office expansion. Hireology’s hiring and talent management platform empowers small and medium-sized businesses to build their best teams while making more money through reduced time to hire and saving money through optimized job board spend. In 2017, the Hireology customer base expanded by 1,100 clients and 49,757 hires were made using Hireology (a 43% increase over 2016). Customers also saw a median 4-day increase in hiring velocity, meaning customers filled open roles almost a full week faster than roles were filled previously. As our team continues to grow, we have a wide variety of job openings across teams. To see the full list of openings and learn more about what it’s like to work at Hireology, visit: https://hireology.com/careers/.